The brokerage firm rolled out automated advice offerings for investors and advisors this year. 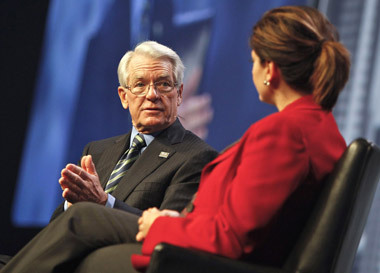 Charles Schwab speaking at a Schwab Impact conference. Charles Schwab, which rolled out its Schwab Intelligent Portfolios robo-advisor service for retail investors in Q1, stated Thursday that the computer-managed service had more than 39,000 accounts and $3 billion in assets as of June 30. Schwab (SCHW) beat analysts’ second-quarter estimates as profits grew 9% to $353 million, or $0.25 per share, from $324 million, or $0.23 per share, a year earlier. Sales increased 5% to$1.57 billion from $1.48 billion a year ago. The company also introduced Institutional Intelligent Portfolios for independent advisors on June 23, giving RIAs access to 450-plus ETFs across 28 asset classes. The San Francisco-based firm says clients opened 280,000 new brokerage accounts, up 16% year over year, and total client assets were $2.54 trillion, up 6%. “In addition to launching these new offerings, we remain committed to expanding existing platforms in areas of strong client demand,” CEO Walt Bettinger said in a statement. “We gathered $37.0 billion of core net new assets, the highest second quarter in our history, and maintained a 6% annualized organic growth rate despite seasonal tax outflows in April,” Bettinger explained. Client assets under the guidance of an RIA or enrolled in a retail or other advisory program rose 6% year-over-year, to $1.26 trillion. By segment, Advisor Services had assets of $1.14 trillion as of June 30 vs. $1.46 trillion in Investor Services. Assets in Advisor Services fell 22% from last year but rose 88% from the prior quarter, when the company had an outflow of $11.6 billion in these operations tied to the resignation of cash management relationship. “We continue to drive growth by leveraging our ‘through clients’ eyes’ strategy and our scale to build products and services aimed at making life better for investors,” Bettinger added. “That scale is evident across our unique in-house combination of brokerage, asset management, and banking capabilities.